For more than a quarter of a century, the Rutgers Children’s Choirs & Scarlet Singers have provided age-appropriate vocal training to pre-college students, grades K-12. All choirs provide an opportunity for young singers to perform choral music with peers who share an interest in singing. The choirs also serve as a learning lab for Mason Gross collegiate music education students. Originally an ensemble for 4th – 8th-graders, the first Rutgers Children’s Choir debuted at the 1993 SummerFest Concert Series under the direction of former Mason Gross faculty member and RCC founder Nancy Cooper. Under Dr. Rhonda Hackworth who led the choirs from 2008-2016, the ensemble grew to include a K–2nd grade singing class (Little Knights), an ensemble for 3rd-5th graders (Choristers), an advanced ensemble for students grades 5-8 (Chamber Singers), and a high school ensemble (Scarlet Singers). Mrs. Rebekah Sterlacci assumed leadership of the Rutgers Children’s Choir & Scarlet Singers in the summer of 2016 after having been the choirs’ Associate Director, and conductor of the Scarlet Singers. Beginning in Fall of 2018, Kason Jackson and Megan Kalberer took leadership of the ensembles as co-directors where they are now shaping the future of vocal music in New Jersey. The Children’s Choirs have collaborated with the Rutgers Symphony Orchestra, the American Repertoire Ballet, and performed for prestigious events such as the American Orff-Schulwerk Association national convention, and the American Choral Director’s Association convention. Little Knights is open to children in kindergarten through second grade. Students learn the basics of singing in an age-appropriate, fun manner! A family singing presentation and social concludes each session. Excellent preparation for membership in Choristers. No audition required. Choristers is a training choir open to children in third through fifth grade with unchanged voices. First-rate, age-appropriate vocal training designed to give singers an excellent foundation for singing. An audition is required to evaluate placement according to age, musical skills, and vocal development. 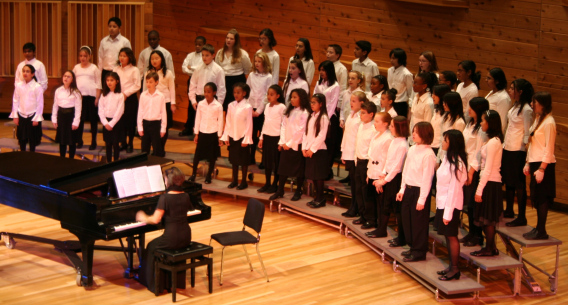 Choristers perform as a stand-alone ensemble and in combination with Chorale. Chorale is an intermediate choir open to children in fifth grade through eighth grade with unchanged voices. First-rate, age-appropriate vocal training designed to challenge students who already have a bit of musical experience. An audition is required to evaluate placement according to age, musical skills, and vocal development. Chorale performs as a stand-alone ensemble, and in combination with Choristers. Chamber Singers is an ensemble open by audition to singers in the Chorale who are ready for the greater musical challenge. Members must commit to singing in both Chorale and Chamber Singers. Members develop strong sight-reading skills, ability to sing independently one to a part, vocal quality, experience with challenging repertoire, and additional performance opportunities. An audition is required for membership in this ensemble. The Scarlet Singers provides an opportunity for high schoolers (and boys in grade 8 whose voices have changed) to study in an environment that nurtures the development of leadership skills. Members demonstrate a commitment to the art of choral singing, and to achieving a high level of musicianship as individuals and as members of an ensemble. Boys whose voices have changed earlier than high school will be allowed to audition for this ensemble. An audition is required.